The Out of Sight, Out of Mind? 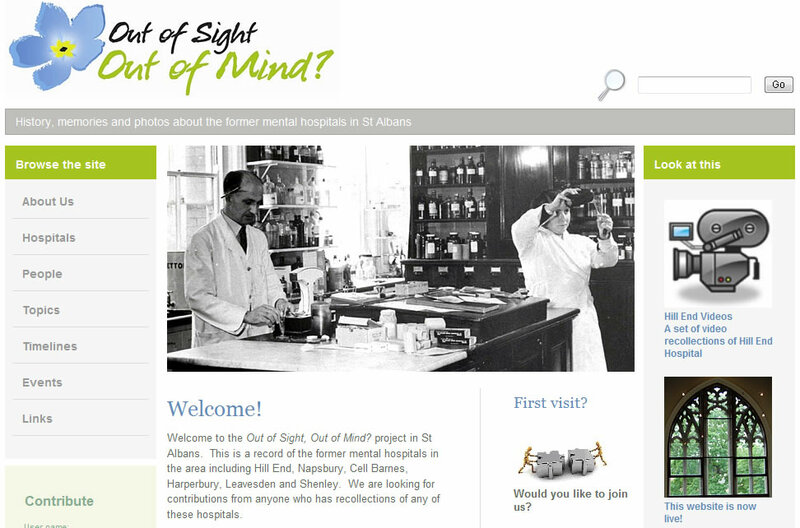 project in St Albans is a record of the former mental hospitals in the area including Hill End, Napsbury, Cell Barnes, Harperbury, Leavesden and Shenley. The information on it has been contributed by former patients, staff and administrators who have had responsibility for the hospitals. It contains information on the history of the hospitals, social activites for both patients and staff, a set of video clips of a former patient describing the buildings and much more. It is a work in progress and contributions from anyone who has any information relating to any of the hospitals are very welcome. Details of how to submit your information are on the web site. The information consists of words, photographs and video clips. It covers the period from the opening of the asylums at the turn of the twentieth century through the closure of the mental hospitals at the end of the twentieth century and continues to their successors of today.